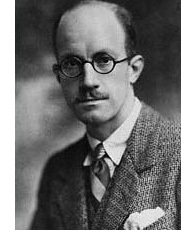 Eric Linklater (1899-1974) was a Scottish writer, who strongly identified with Orkney. He is remembered especially for his novels, a number of which were fantastic (as were a number of his short stories). The Impregnable Women (1938) is a near-future satire, starting with the destruction of London by the French airforce, and retelling Aristophanes’ Lysistrata, with a story of a protest strike by women. A Spell For Old Bones (1949) is a lost race story set in a fantasy first-century Scotland, and A Terrible Beauty (1966) has a man whose world is invaded by characters from his dreams. He published three volumes in which figures from different periods of the past come together for conversations, and two fantasy novels for children: The Wind on the Moon (1944), and The Pirates in the Deep Green Sea (1949). As John Clute notes, in the Encyclopedia of Science Fiction, The Pirates in the Deep Green Sea might be seen as a prefiguration of steampunk. Davy Jones and his pirates live under water thanks to a special concoction, and fight against the pirates who are trying to untie the knots of latitudes and longitudes which tie the world together. Eric Linklater was born at Penarth, Glamorgan, the only son of Robert Baikie Linklater, a master mariner from Dounby, Orkney. The Linklaters (and Baikies) had lived in Orkney for generations, and Eric’s mother, although not Scottish herself, insisted on keeping a holiday house in Orkney. She moved the family home from Cardiff to Aberdeen, and Linklater was at school in Aberdeen from 1913 to 1916. Linklater was initially rejected by the army because of his poor eyesight, but joined up in 1917: see his War Experiences for details. From 1919 to 1925 he studied at Aberdeen University, first in medicine and then in English. Between 1925 and 1927 he was an assistant editor of the Times of India, living in Bombay. After a year working at Aberdeen University in 1927-8, he spent two years as a Commonwealth Fellow in the USA, at Cornell and Berkeley. He began publishing prolifically in 1929: altogether he wrote 23 novels, 3 volumes of short stories, 3 autobiographies, 10 plays, and 23 books of essays and non-fiction, as well as the books mentioned above in the first paragraph. Juan in America (1931) and Private Angelo (1946) were perhaps his best-known novels. He loved the Icelandic sagas, and wrote his own: The Men of Ness: the Saga of Thorlief Coalbiter’s Sons (1932); later, in 1955, he published a book about the sagas, called The Ultimate Viking. On 1 June 1933 he married Marjorie MacIntyre, and after a period in Italy they settled at Dounby in Orkney; they had four children. Between 1939 and 1941 he commanded the company of Royal Engineers on Orkney. In 1941 he was posted to the directorate of public relations in the War Office, and from 1944 to 1945 served in Italy, where he acquired the experiences necessary for writing Private Angelo (1946), which was dedicated to the Eighth Army. It was a book about courage, but it did not celebrate war. Angelo’s remark “I hope you will not liberate us out of existence” might well have inspired William Tenn’s celebrated science fiction story “The Liberation of Earth” (1953). In 1951 he published a history of that part of WW2, The Campaign in Italy, and, with the temporary rank of lieutenant-colonel he visited Korea. In 1945 he was elected rector of Aberdeen University, and in 1947 the family moved to to Ross, and later (in 1962) to Aberdeenshire. From 1968 to 1973 he was deputy lieutenant of Ross and Cromarty. He died in Aberdeen, and was buried in the Harray churchyard in Orkney on 11 November 1974. His widow, already an active political campaigner, moved back to Orkney, to serve as chairman of the Orkney Heritage Society (1977–81). She helped to establish the St Magnus festival, and campaigned for the Scottish National Party. The biographical information comes from Andrew Rutherford’s piece for the Oxford Dictionary of National Biography, revised by Isobel Murray.